Graham Feldwick is the voluntary ‘Handworked Lines’ Records Officer for the Industrial Railway Society and the ‘Archaeology & History’ Editor for the Narrow Gauge Railway Society, both leading and long-standing specialist organisations. Graham and his wife Lesley have a collection of ex-industrial narrow gauge railway locomotives and wagons built up over the past 40 years, have been involved as volunteers in heritage building and narrow gauge railway restoration for a similar period, and also provide help to organisations and individuals. The Industrial Railway Society is devoted to the recording and study of all aspects of industrial and privately owned railways, both at home and overseas. This, of course, includes pier railways in all their various gauges and forms, and the Society has records on each. It’s interesting to see how many piers once boasted a railway, from busy standard gauge lines moving large numbers of passengers, through to those busy using narrow gauge, and then to piers that simply had a line to carry out a humbler, but equally important, task. 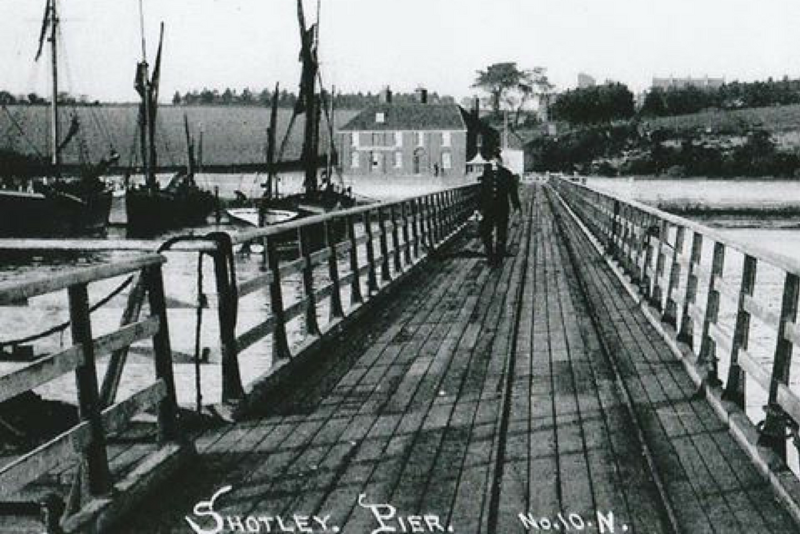 Shotley was one such pier railway. The pier was built with the vision of a new branch line to carry post from Ipswich and beyond, but had to be satisfied with just a simple narrow gauge line on the pier, hand-worked to carry the mail. Pier railways hold a very special place in the history of the use of railways in the UK, and Shotley – being both a Railway Pier and having its narrow gauge line – is an important part of this. Rarely visited, the records for both the Industrial Railway Society and the Narrow Gauge Railway Society are quite brief and their members are now being asked if they have any information to add to this.